One of the reasons we bought our house three years ago was the size and position of the kitchen. I wanted a kitchen 1) that was big enough for a table and chairs, and 2) it opened onto the garden. Apart from that it was a fairly boring developers kitchen with no stand out features. Buying off plan we had some influence over the colour of the cupboards and floor, but the layout of the space and the overall style were all chosen by the builder. Apart from adding metro tiles for a practical splashback (we declined the salesman’s recommendation of 3″ glass splashbacks funnily enough), we’ve done nothing else, and we’ve lived with magnolia walls for far too long. Once we’d moved in, and made some headway on the garden makeover, I started to love the view from the living room through the kitchen door, and straight out to the garden. Especially in the evening when the kitchen is flooded with sunlight. And also on rainy days when the kitchen is the lightest room in the house, and outside the garden looks fresh and green. There was no question about it, I wanted to bring the garden inside the house. 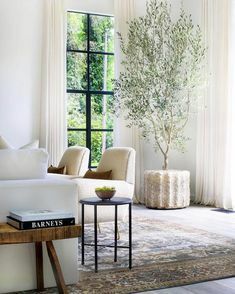 And since one of the biggest trends lately is for botanicals and tropical patterns in the house I didn’t have to look too far for inspiration. I was tempted by some of the very bold Mind the Gap tropical wallpapers at Limelace, but in the end I chose an old favourite from Cole and Son. It’s fresh and contemporary looking and I think more fitting for a kitchen. 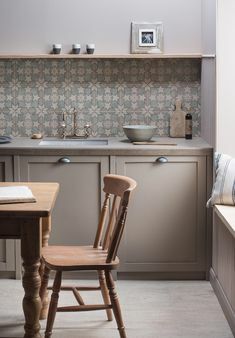 Wallpaper might not be everybody’s choice for a kitchen but I wanted something that would create an impact and add interest to the bare wall on one side of the room. In the end I added wallpaper around the french windows too, to improve even more the view through the doorway. The other two walls are now white. Much as I resisted the idea of putting blinds up at the french windows, I had to give in. That evening sunlight in summer made eating at the dining table almost impossible, so I hunted around for a solution. I’d always thought vertical blinds were just for an office environment but I couldn’t deny the practicality of them. They are almost invisible when they are open (we opted for a split-bunch so that they opened in the middle) and they give total flexibility about how much light you let into the room. An unforeseen advantage has been the privacy they have afforded. I didn’t think I minded the fact that neighbours (from afar I hasten to add) might be able to see into our kitchen, but I can’t deny the feeling of security I now feel. Especially at night. And now that the blinds are up, I absolutely love them. 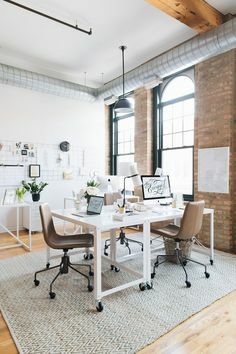 They don’t look like office blinds at all thanks to the wallpaper, and they make the room look complete. I think you know by now I don’t buy new furniture when I can adapt it. We brought the dining table and chairs from the old house and although they are a bit ‘country’ for a new townhouse, a freshen up with black paint on the legs has done the trick. The table now looks more up-to-date and coordinates with the black worktops, the floor and the other black accessories I have. And I’ve fallen in love with it all over again. It’s not always an option in a new house to add lights. Not unless you want to tear down the ceilings. But we had a rogue pendant fitting above the utility area that has come in really handy. A couple of industrial looking ceiling hooks and a few metres of black flex has meant that we can add a light over the table. The metal one I’ve chosen is a bit ‘country’ too so it complements the table. And it’s black. I had to persuade the BF that trailing black flex across the ceiling was perfectly acceptable and even a design statement for some. I must admit I had my fingers firmly crossed because I wasn’t sure I’d like it either. However, it looks great and he now likes the effect. Phew. Yes, the kitchen needs accessories just like any other room in the house. I wanted to add plants but without a window ledge the options were limited. Then I remembered a set of white ladder shelves that I already had. Perfect for plants, candles and a couple of cookery books. On the worktops I’ve kept to a monochrome scheme with touches of wood to warm it all up. And the wood goes well with my newly sanded table top. Which I’m so enamoured with I don’t want to add any wax or treatment. I might live to regret leaving it untreated – time will tell. Lastly I added a new runner to the table and some flowers. Vertical Blinds were gifted from Hilary’s Blinds. Limelace supplied the Cole and Son Wallpaper. The Black Pendant Light is from John Lewis (affiliate partner). The Wooden Serving Boards are from Sainsburys. The Table Runner is from Rockett St George. 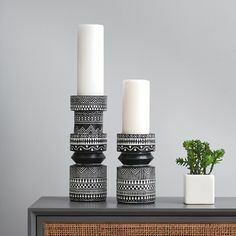 Wow, that looks amazing! From having read lots of your previous posts, I’m not surprised you opted to add green. Looks wonderful. Love the wallpaper design. 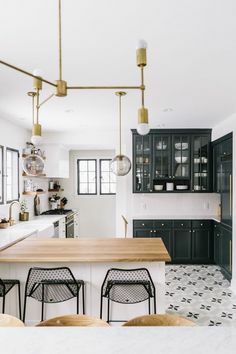 That is such a lovely space, I love how that has turned from a new builds kitchen to something super unique! Checked out your garden space as well! It’s so perfect and fresh. 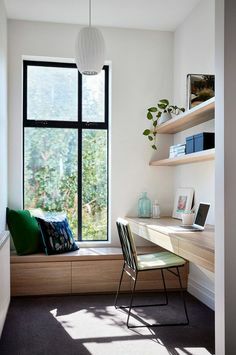 Green and white are one of my favourite colour combinations and your styling is just gorgeous. When can I move in? Haha! Oh wow Carole, what a fantastic room. That wallpaper has made all the difference and definitely added a bit of personality to the room. I actually really like the blinds too. I have vertical blinds in my livingroom but it’s a standard window and I think they look awful. Much better on patio doors. I hope you enjoy your space even more now. Thanks Stacey. BF took some persuading about the wallpaper but even he admits it works. Re the blinds I just have to make sure they’re open when the dog goes outside as he crashes through them. Urghh.